©The Detroit Institute of Arts, Detroit, Michigan. Photograph by Dirk Bakker. 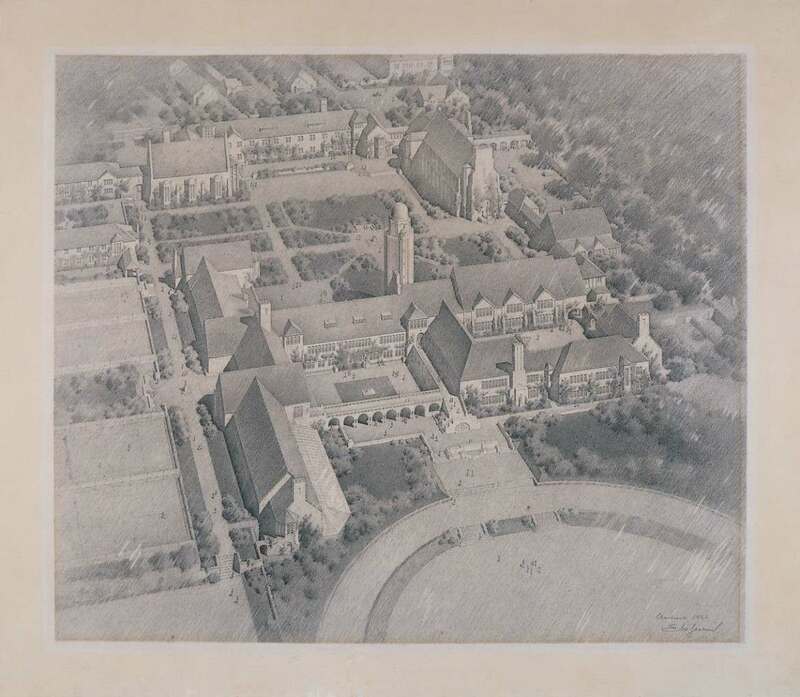 This exquisite drawing of the Cranbrook School Quadrangle captures in delightful detail Eliel Saarinen’s almost completed plan for the new boys’ boarding school complex. Saarinen had given George Booth a simple footprint for the school buildings in the spring of 1925 and returned to the project in the fall eager to develop his designs for the high school. By the time he made this drawing Saarinen had fully visualized the final arrangement of the buildings. The working ideas here include a raised track around the football oval (the track was later lowered to field level), a greenhouse (not realized) along the south wing of the academic building, a meeting space in the quadrangle itself (later embellished with a superb fountain), and a colonnaded walkway for a pedestrian entrance from Lone Pine Road at the upper right (which was not built). Apart from some further changes in the architectural detail of the buildings, the drawing presents the Cranbrook quadrangle buildings almost exactly as they appear today.